When I heard that U.S. District Judge James Redden had, for the third time, rejected a biological opinion designed to protect Columbia River salmon from extinction, my mind leaped to this ongoing question: Will this decision move us closer or further away from removing dams from the Snake River? After reading Redden’s opinion (PDF, 1.1 mb), I’m not sure. But I can understand why various sides of the debate must be feeling a mixture of hope and frustration from a legal battle that has continued for more than 10 years. Redden was clear that NOAA Fisheries (National Marine Fisheries Service) could not conclude that salmon are on their way to recovery by relying on undetermined and unplanned habitat improvements proposed from 2013 to 2018 — not so very far in the future. “Mitigation measures supporting a biological opinion’s no-jeopardy conclusion must be ‘reasonably specific, certain to occur, and capable of implementation; they must be subject to deadlines or otherwise-enforceable obligations; and, most important, they must be address the threats to the species in a way that satisfies the jeopardy and adverse-modification standards. “Here, NOAA Fisheries improperly relies on habitat mitigation measures that are neither reasonably specific nor reasonably certain to occur, and in some cases not even identified…. “It is one thing to identify a list of actions, or combination of actions through adaptive management to reflect changed circumstances. It is another to simply promise to figure it all out in the future…. In a footnote, Redden said he is troubled that the agencies have been unable to come up with numerical predictions for salmon survival based on the habitat improvements proposed. By 2014, Redden wants a new biological opinion that thoroughly discusses the mitigation efforts but also addresses “more aggressive action, such as dam removal and/or additional flow augmentation and reservoir modifications…. That last sentence about the difficulty of relying on mitigation measures keeps the door open to a future court order involving dam removal — but Redden clearly understands that he cannot replace a biological opinion with a legal ruling. Will Stelle, regional director of NOAA Fisheries put a positive spin on the ruling. He told Scott Learn of The Oregonian that adding more detail to the biological opinion should be enough satisfy the judge. “Now is the time for the Obama Administration to walk the talk on real salmon solutions. As this ruling highlights, the federal government has spent nearly 20 years spending enormous sums of money foolishly by doing all the wrong stuff. “Facing the problem squarely, including potential removal of the four fish-killing dams on the lower Snake River, will create many thousands more jobs, revive the fishing industry, save billions of dollars for taxpayers, and lead in the development of clean, renewable, more efficient energy. The annual North of Falcon process is about to get under way again, beginning with a public meeting in Olympia on Tuesday. During Tuesday’s meeting, state, federal and tribal managers are expected to outline their preseason forecasts of abundance for each salmon species. See meeting announcement in the Kitsap Sun and on the North of Falcon website. 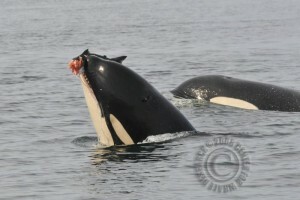 Photo by Astrid Van Ginneken, Center for Whale Research. This year, there will be a new elephant in the room … actually, something as large as an elephant — a killer whale. But more about that in a moment. The process of determining how many salmon of each species are available for harvest and how to divide up the catch has become a complex project involving commuter simulations, policy discussions and demands from fishing constituents. The goal is to make abundant stocks of salmon available for harvest while protecting “weak runs” — particularly those listed under the Endangered Species Act. Sure, the process has its flaws, but I have not heard of any better ideas for protecting weak runs outside of stopping all fishing for a period of time. So far this year, I haven’t had time to get a head start on what salmon managers are thinking, but I’ll be following the discussions as they move along. I’ve been thinking about the comments people sometimes post on this blog, blaming all the salmon problems on commercial fishing, tribal fishing or the locations of fishing nets. Because such comments are often based on a lack of knowledge, I was wondering if such folks ever consider attending these meetings to find out how fishing decisions are made. The meetings, which are open to the public, begin with general discussions and get more technically oriented right up to the point when final decisions are made in mid-April. While the fishing issues are complex by themselves, it is becoming clear that anglers and tribal fishermen may soon need to share their chinook salmon — a highly prized sport and table fish — with another species, the Southern Resident killer whale, an endangered species. “The basic question NMFS must answer is whether Chinook salmon fisheries that affect the abundance of prey available to the killer whales are significantly and negatively affecting the well-being of the Southern Resident population and, if so, how those negative effects might be reduced. “Our conclusions, which are preliminary at this point, strongly suggest that the amount of Chinook available to the whales in comparison to their metabolic requirements is less than what we estimated in the 2008 consultation, particularly during those summer months when the whales spend considerable time foraging in the Salish Sea. While allocations for killer whales may not be explicit this year, the workshops could result in reduced harvest under the next Puget Sound Chinook Management Plan. For a more detailed discussion of the early analysis, download “Effects of Fisheries on Killer Whales” (PDF 345 kb). For an outline of the proposed discussions, go to “A Scientific Workshop Process to Evaluate Effects of Salmon Fisheries on Southern Resident Killer Whales (PDF 21 kb). To read a news story on the topic, reporter Craig Welch touched on the issue in the Feb. 11 edition of the Seattle Times.